Port City Marina in Wilmington, North Carolina is a favorite stop for many boaters and megayacht owners and crew. So, too, do many owners and crew treasure Carolina builders Hatteras Yachts and Jarrett Bay Boatworks, located in New Bern and Beaufort, respectfully. 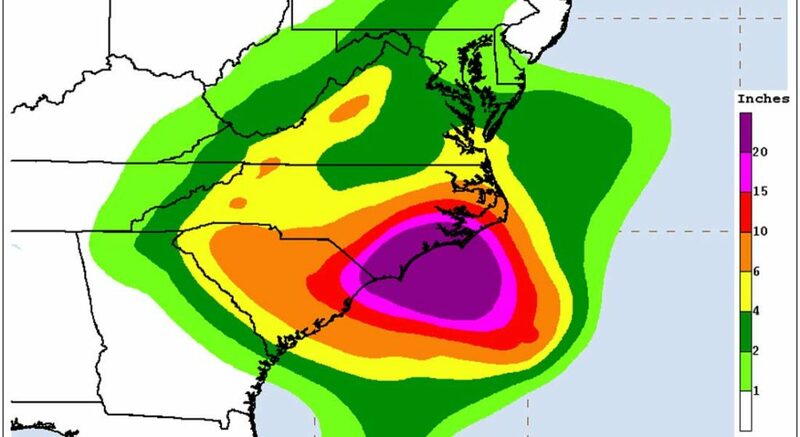 So, many eyes were trained on the path of Hurricane Florence as it came ashore on September 14, directly over these areas. They’ve remained trained on the region since then, too, due to the snail-like pace of the storm remnants, dumping months’ worth of rain in mere days. The good news is, each business is still standing. Hurricane Florence and its aftermath have been devastating. The storm made landfall as a Category 1 hurricane at 7:15 a.m. local time Friday. Wilmington experienced gusts of 100 mph. By Friday night, the storm was no longer a hurricane, but still subjecting the area to maximum sustained winds of 65 mph. Furthermore, it was moving inland at only 5 mph—slower than a human can walk. The National Hurricane Center therefore warned of “catastrophic flash flooding and prolonged significant river flooding.” This was due to anticipated rainfalls approaching three feet in some areas. The illustration at top reveals just some of the predictions through September 19. The predictions so far are accurate. According to the National Weather Service, as of 2 p.m. on September 16, nearly 24 inches (0.61 meter) of rain had fallen on Wilmington. Rain continued throughout the day as well. Post-Hurricane Florence flooding has cut the city off from major roadways. The Port of Wilmington on the Cape Fear River, where Port City Marina lies, is also closed. In Morehead City, near Jarrett Bay’s home of Beaufort, the rainfall total on September 16 was 21.36 inches (0.54 meter). Flooding continues today. New Bern, meanwhile, experienced 16.65 inches (0.42 meter) of rain by the afternoon of the 16th. The city reported flood waters were rising 12 inches per hour in the early hours of that morning. Today, while some parts of the city are open, others remain flooded. The marina lost internet this morning so info is slowed. However the marina is fine as well as 99% of the boats. Last high tide last night saw 6-8 foot of piling left. The river is supposed to crest Wednesday to unprecedented levels since 1877 however we don’t think it will breach pilings but nobody knows for sure. All roads in and out of Wilmington are flooded and impassable. Hatteras, which is on relatively high ground in New Bern, issued a brief Facebook update over the weekend. It says that the facilities and boats survived the storm, and hopes to have power back by Tuesday. This morning our team led by Tate Lawrence was back on site. They tell us the flood water has almost receded and while we have flood and wind damage to the buildings it can all be repaired. We do not see any additional issues to any of the boats other than minor damage and all feel fortunate. The Beaufort waterfront has had a great deal of flooding and we are sure we will have significant damage to our retail store. Obviously we will be closed to in person and on line sales until we understand the extent of the damage. There is a 24 hour curfew in place for Beaufort and Morehead City but as we can get our crews on site to assess the situation we will give you more details. For the time being our thoughts and prayers are for our co workers, friends and the community. We know that many have had significant damage and some have lost everything. We are committed to doing anything we can to help them in the recovery effort.